The 2018 Ford Flex is more than just its stylishly unique look. It’s also one of Ford’s most capable and functional SUVs thanks to its vast interior that can comfortably and easily seat up to seven full-grown adults while storing anything and everything that comes along with them. And we’ve got it all right here at Akins Ford near Atlanta, GA. 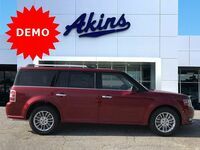 The new Ford Flex is able to do what it does thanks to its 155.8 cubic-feet of total passenger space and its vastly spacious cargo area. More specifically, the 2018 Ford Flex provides you with 20 cubic-feet of cargo space behind its third row, 43.2 cubic-feet of cargo space behind its second row and a whopping 83.2 cubic-feet of cargo space if you fold down those second and third rows. The new Ford Flex is also able to tow up to 4,500 pounds, so you’ve got all the cargo capacity and towing capability you could ever need for road trips, errand runs and everything in between. All of that interior passenger and cargo space comes with the choice between two powerfully capable engines. The standard engine for the 2018 Ford Flex lineup is a 3.5-liter Ti-VCT V6 engine capable of providing you with 287 horsepower and 254 pound-feet of torque while getting you 16 miles per gallon in the city and 23 miles per gallon on the highway with front-wheel drive, and 16 miles per gallon in the city and 22 miles per gallon on the highway with all-wheel drive. A 3.5-liter EcoBoost V6 engine is also available, offering 365 horsepower and 350 pound-feet of torque while getting 15 miles per gallon in the city and 21 miles per gallon on the highway. This engine is only available with all-wheel drive. Both engines are paired with a 6-speed SelectShift automatic transmission. The 2018 Ford Flex also comes with a wide array of standard features. This list includes four 12-volt powerpoints, an auxiliary audio jack, a battery management system, electric power-assisted steering, steering wheel mounted controls, the MyKey system, a reverse sensing system, the SYNC infotainment system, AdvanceTrac with Roll Stability Control, an illuminated entry, a perimeter alarm, the Personal Safety System, a rearview camera, remote keyless entry and much more. There are also multiple optional features available, such as advanced new driver assistance systems and a larger SYNC infotainment system. 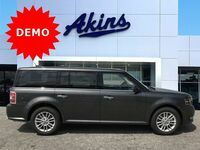 For more on the 2018 Ford Flex, please contact our friendly Akins Ford staff near Atlanta, GA.